An Award of Distinction in the Hardware/Appliance Category of the 2003 Powder Metallurgy Design Excellence Awards Competition was presented to ASCO Sintering Co. for a PM Sintered Low Alloy steel lever and screw block that operate in Craftsman Grip Master locking pliers. The lever allows the user to choose between the locking and non-locking mode. The complex multi-level tool design produces parts are made to a density of 6.8 g/cm³. They have an ultimate tensile strength of 130,000 psi, a transverse rupture strength of 210,000 psi, a fatigue limit of 41,000 psi and a 32HRC hardness. Secondary operations include drilling and tapping holes in the screw block, heat treating, and a black oxide finish for corrosion protection. 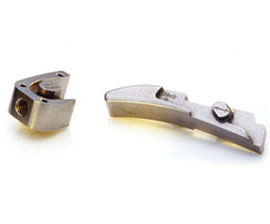 Producing both parts using the Conventional Press and Sinter Powder Metallurgy process provided a 50% cost saving when compared to traditional machining from bar stock.